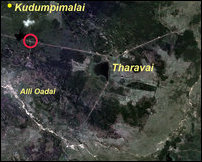 The occupying Sinhala military chased away the residents of four villages in Kudumpi-malai GS division, which is also known as Thoppik-kal and Baron’s Cap, during the times of war in 2007. 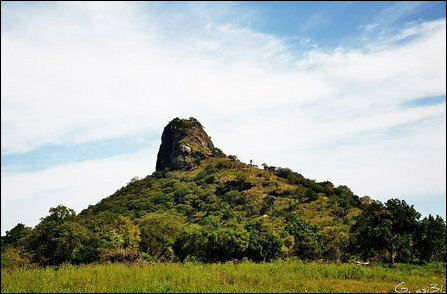 The villages are located close to Polonnaruwa border. Although the uprooted Eezham Tamils were allowed to resettle back in 2013, the fertile highlands at Periya Miyaang-kal village, owned by Tamil settlers since 1969 were being retained by the occupying Sinhala military occupation. Even though the SL Army relocated its 11th Regiment troops from the location two years ago in 2017, the Tamil landowners are not being allowed to enter their lands. 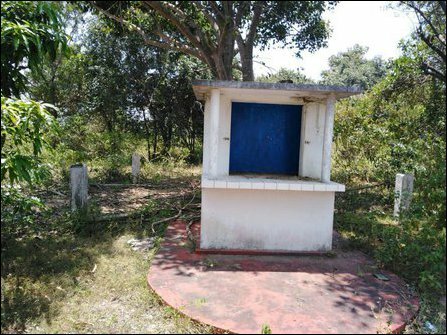 Now, the SL authorities have started to claim that the grounds have become ‘state property’ says Nagarasa Nagathamby, who was living there since 1969. 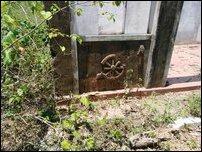 The Buddha statue and the structures are intact, and the Tamils fear a Sinhala colony at the locality. When the SL authorities provided alternative lands in 2013, the poverty-stricken Tamil villagers with low literacy skills were asked to put their signatures in papers that were in Sinhala. They were told that the signatures were to ensure that their original lands getting released to them when the SL military relocated its camp. 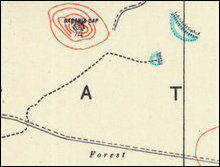 The people agreed to reside in temporary low-lying lands without any infrastructure until the SL military was prepared to leave the area. 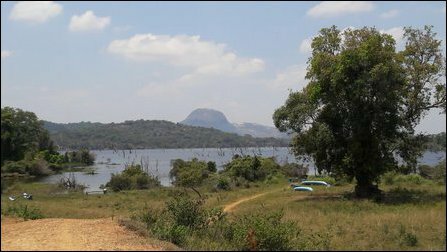 Now, after the SL military has relocated from the 20 acres of lands, the SL authorities are claiming that the properties belong to the SL State, Mr Nagathamby told TamilNet. There is no infrastructure at all. No potable water, no electricity and no transport. The residents get attacked by wild elephants, Nagathamby further said. However, the SL military is having exclusive arrangements for Sinhala tourists. Tamil residents are systematically discriminated and neglected. The situation will continue until the village gets finally colonised with Sinhala settlers from the bordering Polonnaruwa, they said. 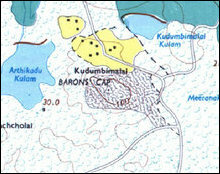 Four villages comprising of Periya Miyaang-kal (35 families), Chinna Miyaang-kal (37 families), Kudumpi-malai (28 families) and Meeraa'nda-kadavai (21 families) come under the GS area of Kudumpi-malai. During the times of war, it was a stronghold of the LTTE, which had a base at Meeraa'nda-kadavai. 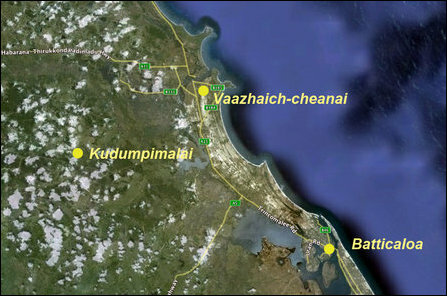 Kudumpi-malai is located 54 km north of Batticaloa city and 15 km east of Vaazhaich-cheanai. It comes under the administrative division of Ko'ra'laip-pattu South (Kiraan). The Kudumpi-malai hillock is locally believed as an abode of God Murukan and the Murukan temple has a long history. The SL military has a military post on the top of the hill and uses Murukan temple to store military hardware. The local people are also prevented from visiting the Ka'n'naki temple situated near the hillock in the jungle area, where they traditionally perform annual rituals like Madai and Ku'lirththi. Alli Oadai Junction, located on Vadmunai Kiraan road is also known as the 9th mile-post junction. SL military is stationed at this junction. The Tamil name, Alli Oadai has been Sinhalicised into ‘Ali Oluwa’ in Sinhala. The occupying SL military stationed at Alli Oadai has been harassing the Tamil villagers for a long time. The military, which has built a ‘victory monument’ has been promoting so-called heritage tour promoting a nearby site as “Thoppigala Heritage Park” in collaboration with various SL ministries in Colombo. The Sinhala military is operating a modern cafeteria, hosts ‘leadership training’ and operates ‘adventure games’ for the Sinhala ‘heritage’ tourists. The ‘park’ is maintained by the SL military. 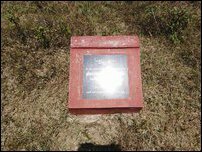 SL Army's 232 Brigade is stationed a few hundred meters away at Tharavai, where the largest Tamil Eelam Heroes Cemetery in the Batticaloa district was located. 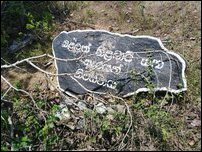 More than 675 fallen Tamil fighters lay buried at Tharavai Heroes Cemetery, which has been razed to the ground by genocidal Sinhala military. The SL State has been scheming intense demographic changes to the division with an aim to annex some of the villages with the neighbouring Polonnaruwa district, similar to grabbing parts of the Mullaiththeevu district in the north to annex with Anuradhapura district. 25.12.17 Sinhalicisation targets interior hill-top northwest of Batti..
28.05.17 Rigid military ‘pass system’ continues to restrict freedom o..
20.05.17 Resettled Tamils complain increased harassments by SL milita..